2 more months and our AK is 2yo! 2 more months and I hope I will be going to Japan! 4 more months and it’d be Christmas! July has been a pretty hectic month for me personally and professionally. Nevertheless, I’m thankful that we’re all good and healthy – in one piece. My kids are growing up so fast I wish I could press on a PAUSE button. Ashley has been chosen as 1 out of the 6 winners for a nationwide english speech competition and she will be making her way to Korea soon with all the winners to meet other winners from all over the world for a camp. We’re very proud of her achievement. She gets to go to Korea before this ahjumma. Boo hoo! Aidan recently accompanied his dad for a football tourney at Cambodia. It was his first daddy-son trip and he was excited to be able to be other veteran footballers. 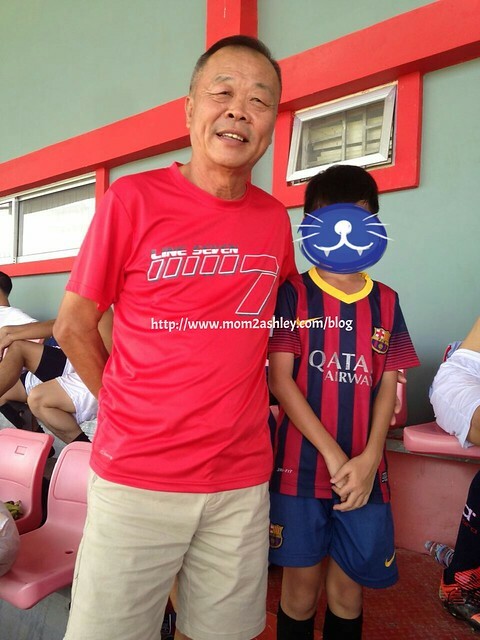 He also managed to take a photo with the Malaysian football legend – known fondly as Tauke. Aidan is not going to pleased if he sees this picture and see what I have done to his face. LOL. Anyhow, what do we have in store for August! This will be an exciting & challenging month for me and I look forward to it!